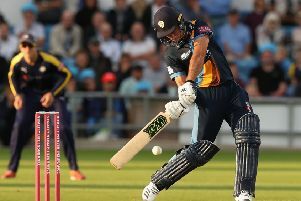 Rain helped Yorkshire Vikings notch their first NatWest T20 Blast win of the season by just one run against Derbyshire Falcons at Headingley. Chasing a modest 154 target, Yorkshire were 67 for three in nine overs when light rain swept across the ground, exactly the score they required to win the game under the Duckworth Lewis method. After losing their first three matches in the competition and then having two no-results, this was just the result that bottom-of-the-table Yorkshire needed and it brought some comfort to the 7,114 fans who turned out on a dreary afternoon. Put in to bat, Derbyshire were never able to bring any real momentum to their innings and they were partly held in check by off-spinner, Azeem Rafiq, who has been brought back to Yorkshire on contract until the end of the season. Man-of-the-match Rafiq, who was the county’s Twenty20 captain for a spell, was playing his first game in almost exactly two seasons and he was brought back after some impressive performances with the Second XI. He struck with only his fourth delivery having come on at 18 for the loss of Neil Broom’s wicket. His second ball was smacked for four by Chesney Hughes who then sliced him high to Liam Plunkett at cover. It became 35 for three in Rafiq’s next over as Hamish Rutherford was caught at deep mid-off by Adam Lyth for 15 and although Rafiq was less successful in a later spell he still finished with figures of two for 33 from his four overs and also held on to two good catches. Left-arm spinner, Karl Carver, also bowled well to claim one for 17 from three overs but the best figures were returned by Tim Bresnan who finished with three for 22. Too many of Derbyshire’s batsmen got out to miscued shots that sailed into the hands of waiting fielders and although Shiv Thakor reached 30 and James Neesham and Alex Hughes made it into the 20s no-one played the big innings that the Falcons were looking for. The best stand was for the fifth wicket, Thakor and Neesham adding 44 together before Neesham skied Plunkett to Gary Ballance at cover, his 23-ball innings containing three fours and a six. Yorkshire’s one-day captain, Alex Lees, dropped himself from the match in order to accommodate the in-form Lyth who blasted centuries on consecutive days in 50-over matches last week, New Zealand skipper, Kane Williamson, taking over the reins. With rain threatening, Yorkshire needed to keep up with the required rate and Lyth made sure that they did, hitting Wayne Madsen just over deep mid-on for four in the first over and driving a straight six off Ben Cotton. David Willey was lbw to Madsen for eight to make it 26 for one in the fourth over and he went on to blast Neesham for four and six while Williamson drove Madsen sweetly for six. Having faced 16 deliveries for his 30 from 16 balls with three fours and two sixes, Lyth attempted to reverse sweep Matt Critchley but missed and was lbw. Yorkshire had two of the best batsmen in the world together with Williamson and Joe Root but at 60 Williamson was out to a cruel piece of misfortune, Root driving the ball back to Alex Hughes who brushed it into the stumps with the Kiwi just out of his crease. With their strong batting line-up, Yorkshire would have been favourites to reach their target had not rain intervened but it was still a cruel way for Derbyshire to lose the match. Before the game began Yorkshire president, John Hampshire, and both teams lined up for a minute’s silence in memory of murdered Birstall and Spen MP, Jo Cox, after which the crowd burst into spontaneous applause. Azeem Rafiq said: “It was a brilliant day for me but it was even more important that we got over the line. “I really enjoyed myself and it was nice to get a wicket with my fourth ball. “Kane had the idea in his mind to bring me on early and he mentioned it to me before the game, so I was ready for it when I came on.